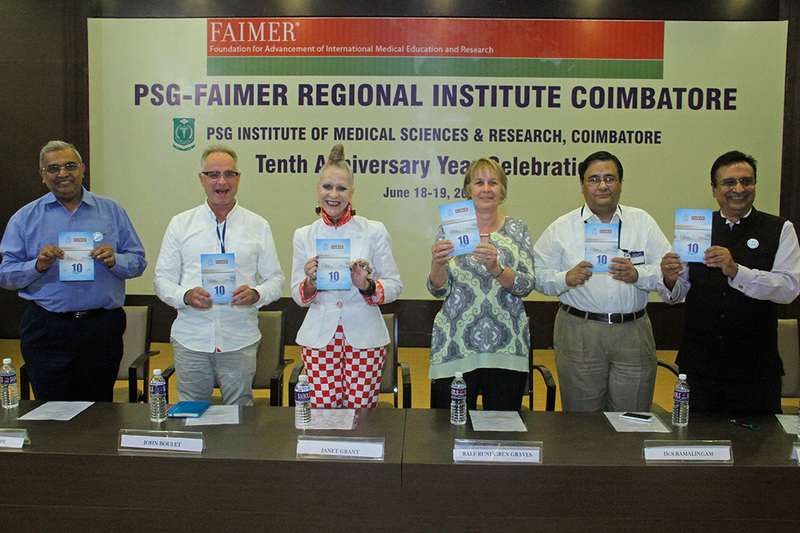 In June 2016, the PSG-FAIMER Regional Institute welcomed its 10th class of Fellows and celebrated this important milestone in Coimbatore, India. Approximately 120 people took part in the decennial anniversary celebration on June 18, including the 16 incoming PSG-FAIMER Fellows, alumni, and local and international faculty. Presiding over the celebration was Dr. S. Ramalingam, Dean of PSG Institute of Medical Sciences & Research and a 2010 PSG-FAIMER Fellow. FAIMER’s Director of Regional Institutes, Ralf Rundgren Graves, served as Chief Guest and presented PSG-FAIMER Director Dr. Thomas Chacko with a commemorative plaque. Felicitations were offered by Dr. Avinash Supe, Director of the GSMC-FAIMER Regional Institute; Dr. Jack Boulet, FAIMER Vice President for Research and Data Resources; and Dr. Janet Grant, Director of The Centre for Medical Education in Context (CenMEDIC) in the United Kingdom. On June 19, alumni and Fellows took part in four capacity-building workshops facilitated by international faculty. PSG-FAIMER, the fourth of FAIMER’s Regional Institutes to be developed, began in 2007 under the direction of Dr. Chacko. Dr. Chacko is Professor and Head of the Department of Community Medicine and Medical Education at PSG Institute of Medical Sciences & Research, as well as a 2004 Fellow of the FAIMER Institute. More than 150 health professions educators from India and other parts of South Asia have participated in the program over the past decade. To commemorate the 10-year anniversary, a booklet was published to highlight the history of the PSG-FAIMER program and share reflections from faculty and Fellows. A copy of the booklet (PDF – 6 MB) can be accessed here. We are saddened to share that Dr. Latha Rajendra Kumar (2009 PSG-FAIMER Regional Institute Fellow) passed away on June 25, 2015 after a battle with leukemia. Latha was Professor and Head in the Department of Physiology at Yenepoya Medical College, Mangalore, India. She was also Deputy Director of the Centre for Health Professions Education at her University, Coordinator of the Medical Education Unit at Yenepoya Medical College, and the Convenor of the Student Mentor Program. Born in 1965, Latha’s early life was a struggle when, after receiving a dose of the oral polio vaccine, she unfortunately acquired poliomyelitis. She spent most of her childhood visiting hospitals, undergoing surgeries and physiotherapy. Yet, with the strong support of her parents, she learned to focus on positive things and try to achieve her ambitions with grit and will power. Although she missed a normal childhood, Latha completed her schooling and went on to earn her M.B.B.S. She was a high achiever and won six gold medals for her proficiency in Medicine, Surgery, Obstetrics, and Gynecology at Kilpauk Medical College, Chennai. She completed her M.D. in Physiology, again winning a gold medal, and decided to take up teaching as her profession. She taught Physiology at the Asian Institute of Medical Science and Technology in Kedah, Malaysia and at the Father Muller Medical College in Mangalore, India, before joining Yenepoya Medical College in 2011. 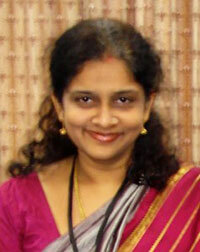 She went on to pursue her research interests and earned her Ph.D. from Mangalore University in 2012. Latha was selected for the PSG-FAIMER Regional Institute fellowship in 2009, where she worked on identifying learning styles of students. She received a national honor in the form of the “Rashtriya Gaurav award” on December 14, 2010 for meritorious services, outstanding performance, and remarkable role and achievements in the field of medicine and medical education. She was awarded the Fulbright Scholarship in Medical Education in 2012 and traveled to the United States, where she spent some time teaching medical physiology at Robert Wood Johnson Medical School, University of Medicine and Dentistry of New Jersey. Her project was titled, “Teaching medical physiology using appreciative inquiry-learning style model.” While in the United States, she was also invited to deliver a guest lecture at the University of Chicago on “Current practices and innovations in Medical Education” and “Appreciative inquiry-learning style model.” She also had several papers published in medical education journals. After Latha returned to India in 2012, she continued to work at Yenepoya University, and enabled the Medical Education Unit and Centre for Health Professions Education to soar to new heights. She was diagnosed with acute myeloid leukemia in February 2015. Her family, friends, colleagues, and students rallied around her at this hour. She underwent a stem cell transplant, but unfortunately succumbed to complications. She is survived by her husband KP Rajendra Kumar, her son Tarang, and her daughter Twaja. Latha was an amazing woman, who learned to live life to the fullest. If there is one feature which defined her, it was her persistence. In the face of adversity and despite the numerous physical hurdles that came her way, Latha never gave up on her dreams. She will be deeply missed by the FAIMER family.